Wangsa Maju LRT station is an elevated rapid transit station in northern Kuala Lumpur, Malaysia, forming part of the Kelana Jaya Line (formerly known as PUTRA). The station was opened on June 1, 1999, as part of the line's second segment encompassing 12 stations between Masjid Jamek station and Terminal PUTRA (not including Sri Rampai station) and an underground line. 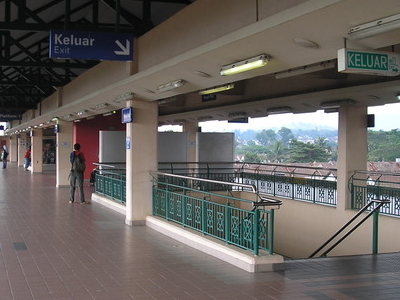 Wangsa Maju station is the third last station northwards to Gombak. The station is situated directly within the northern Kuala Lumpur suburb of Wangsa Maju. The station, located along the main thoroughfare of Jalan 1/27A (Malay; English: 1/27A Road) running from the northwest to the southeast, is wedged between two residential estates: Section 1 of Wangsa Maju to the southwest and Desa Setapak (Setapak Countryside) to the northwest, with Section 2 of Wangsa Maju located further northwest. In addition to accessibility from Jalan 1/27A, the station is also connected via Jalan 16/27B (16/27B Road), Desa Setapak's residential road. Due to its proximity to various shopping centres and two higher education institutions - which are TARC and UTAR - in the region, the station is usually busy during the weekdays. Here's the our members favorite photos of "Railway Stations near Wangsa Maju". Upload your photo of Wangsa Maju LRT Station!